Hello! I’m Kayla! I am the fourth and final leg of our Wags and Walks social media team. Specifically, I manage our Instagram and Social Influencer program. Like the rest of Team Wags, I am so excited to have the blog back up and running! I love the girls I get to collaborate with on a daily basis. It’s amazing working with women who are so passionate about the same thing as I am! We all donate most of our free time to Wags and Walks to help make Los Angeles No-Kill. Here is my story! Back in November of 2014, I found Wags and Walks through some very adorable puppies! Kimmy called me to discuss my adoption application, and by the end of the call she had recruited me to help with Wags and Walks Instagram. At the time of applying I thought the pups were younger than they were, and that we would have at least a couple weeks before they could go home. My husband, David, and I were right at the end of buying our first house and needless to say – we had a lot going on so we made the tough decision to not adopt one of the puppies. Since then, I have become involved in more ways than I could have ever imagined, and I have also gained another family. I grew up in a very small town (pop. ~2,500) and our first dog was a Rottweiler, who joined our family after a friend of my parents needed to rehome him. His name was Butch and he was literally the sweetest dog and cared so deeply for my sisters and me. He was always part of our dress up parties, and would kindly share the spotlight with our cats. Butch passed away from cancer when I was 12 years old. For the next 4 years I continued to remind my parents that we needed to get another family member (but I got another little sister instead haha). Finally, on my 16th birthday I received Mocha, a 2-month-old Rottweiler. Instead of playing powder puff football my senior year of high school – I was at dog training classes. She wasn’t just my dog, she was our family member and so when I went to college she stayed with my family. Mocha passed away of cancer, as well, when she was just 9 years old. I was away on a work trip when my mom Facetimed me as they were arriving to the emergency vet. The vet was picking her and her bed up when I told her that I loved her. She looked at me (via Facetime) and barked back, she was gone before she arrived inside. Four months before Mocha went to dog heaven, David and I adopted @BlueBrill together. We adopted her from an LA based rescue and literally fell in love at first sight. We walked into the adoption event and my husband said, “We are adopting her”, and she has been our little girl since. Being from a small town in Central Oregon, I was unaware about the amazing rescue community before we adopted Blue. I was also unaware how amazing and life changing adopting a pit bull is. 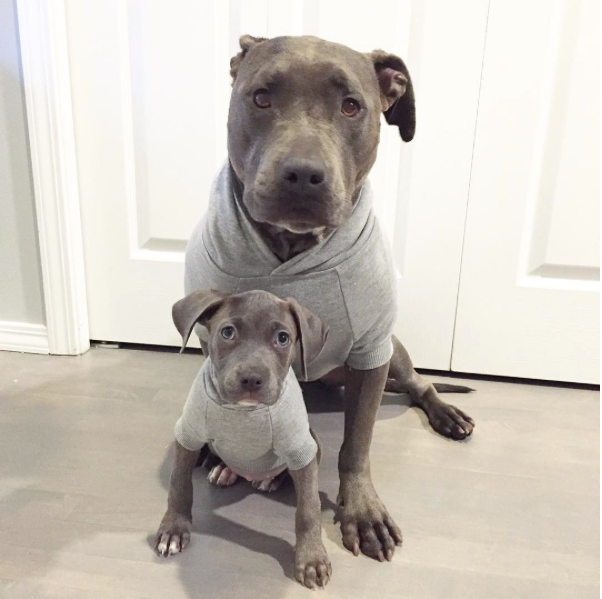 Truthfully, when we were adopting we didn’t know much about the breed, just the negative stereotype and that there were so many pits in the LA shelters. We want everyone to know how amazing pitbulls are, so we take great pride in Blue being a breed ambassador. We continue to train with her (with Go Off Leash) and socialize her; she goes to daycare a couple days a week at West LA Dogs. We recently fell in love with (and adopted) another little girl – Bora Brill. Blue and Bora are best friends and I can’t help but take a photo every time they sleep with their heads together. I honestly can’t imagine what my life would be if we hadn’t adopted Blue, as she has led us to so many more amazing people and experiences, including Bora. They have made our lives more fulfilling. Who would have thought that a dog could do something like that?! That is what I live for now. I love helping other families find their newest family member. We have since fostered 29 dogs for Wags and Walks. I have cried multiple times when a family has an immediate connection and finds the dog that adds what they were missing. Yes, fostering and letting them go is hard but we always know that we have to gear up for the next one so that another life can be saved. You never know when you will set eyes your newest family member, so make sure you are following us on Instagram, Facebook, Twitter and Snapchat (@wagsandwalks). Also, I encourage you to get involved by volunteering or fostering! I can promise that you won’t regret it. I am happy to answer any questions you have about either so comment away! My name is Kelly, another member of the Wags social media team, and I’m so excited to share my journey from adopter to volunteer with you! Ever since I can remember, I have loved animals – growing up in Oregon, my family had two dogs, all kinds of goldfish, hamsters, parakeets, mice and rats, even a couple caterpillars - and a worm that I “rescued” from the sidewalk and named Susan (after Susan from Sesame Street)! I begged my parents constantly to get a cat, but it never came to fruition because my dad was allergic. Sigh. I got lucky when I moved to LA almost 13 years ago though – I ended up living with a roommate who had two cats so I got all kinds of kitty cuddles then! I continued my small animal parenting for years, adding more parakeets, hamsters and even a hermit crab into the mix, but I yearned for a dog of my own. Fast-forward a few years, after my husband and I moved into a very dog-friendly apartment complex and became the go-to dog-sitters for our friends. It broke my heart every time we took the dogs back to their owners – the apartment always felt so empty – so I was beyond ecstatic when we finally decided that we were ready to start looking for a dog of our own. Adoption was always the way we were going to go, as we knew of the overpopulation problem in LA, but that meant that it would take a little bit more time to find just what we were looking for. I spent every moment I could scouring the internet for a non-shedding, house-trained dog no younger than two years (who has time to train a puppy these days?) but every one I found just didn’t seem to be right. Then I stumbled across Dustin, a ridiculously cute tan cockapoo, who was available for adoption through a rescue called Wags and Walks. I had to have him – he was perfect! I scoured the Wags website, taking in as much information about the organization as I could, and found a photo of Kristen, one of their volunteers who just so happened to be the roommate of a coworker of mine. I vaguely remembered her mentioning a dog rescue that she volunteered for, and when I discovered it was Wags I knew these were the folks we were going to get our new family member from. Unfortunately things with Dustin didn’t work out (we were out of town the week of the adoption event where he ultimately found his forever family) so I kept looking. A few weeks later, I found a picture of a litter of spaniel mix puppies that Wags had recently scooped up and showed my husband – forget everything I said about not wanting a puppy, one of these guys was it! After filling out an application and waiting a week or two until they were old enough to adopt, we set up a time for a meet & greet. Charlie and I both had an idea of which dog we wanted – the tan boy with white markings on his face. Luckily for us, that exact pup was the one who trampled over all of his other siblings to come say hello, and he couldn’t stop licking my face when I picked him up! It was instant – this little guy was our new puppy! Fast-forward a few months. I couldn’t believe that such an amazing little pup (who we named Clyne) and his family had been on the streets, and became obsessed with spreading the word about shelter dogs all across LA. I even created a Facebook page for Clyne so he could act as an advocate for his fellow shelter dogs! Then I noticed a Facebook post from Wags looking for more volunteers to help in various avenues, including social media. With my job, I don’t have a lot of spare time to volunteer in person, but social was something I could do from home (and during down time at work), so I offered to help. I was so grateful to this organization for finding our newest family member, and every volunteer I had been in touch with had been so friendly and helpful that I just knew this was the perfect way for me to repay them for the joy they’d provided my husband and I. Plus, I could play a small part in saving lives! It’s been just over a year since I joined the Wags team, and in that time I have been able to watch us grow from operating out of a garage to a bona-fide office! We have saved almost 700 lives, grown both our social and leadership teams, gained a TON of amazing fosters and volunteers, and have formed great partnerships with companies and organizations all over the city. We have amazing adopters who love to share photos and updates of their pups, and even hold reunions for our past litters so they can play with their siblings and we can see how they’ve grown! I have made amazing friends and couldn’t be more proud to be a part of such a wonderful, warm, caring group of people who want nothing more than to help change the lives of dogs (and humans!) all over Los Angeles. Are you involved in dog rescue? We would love to hear the story of how you got started - feel free to share in the comments below. If you’re in the Los Angeles area and interested in getting helping Wags and Walks, please fill out a volunteer application - the more amazing people we have on our team, the more lives we can save! Oh, and follow Clyne and his adventures on Facebook and Instagram! I’m not as good at keeping up with it as I used to be, but with our first kiddo due any day now I have a feeling there will be some pretty adorable photos to check out in the future. Hi everyone! My name is Rachel, and I’m part of the Wags and Walks social media team. I’m so excited that we’re starting the W&W blog back up, and that I get to share the story of how I found this amazing organization, and what it taught me about dog rescue (and about so much more). It’s pretty appropriate that I help out with social media for Wags and Walks, because that’s exactly how I found my dog. And that post that you see above is how it all started. I had been following Wags and Walks on Instagram, and knew that I wanted to adopt a dog… I was just waiting for the right one. And when I saw this post, I fell in love with that fluffy black dog on the left. In the screenshot above, you can even see my comment about putting in an application! I was lucky, and got to meet this sweet girl the very next day, and ended up taking her home with me. I had no idea how much this would change my life for the better, and open up a whole new world to me… the world of dog rescue! Growing up, I always loved dogs and knew I wanted one of my own eventually. Our family dogs growing up were purebreds from breeders, which was really all we knew about. And I loved them so much… they were my sisters, my best friends, my babies. I had no idea about the world of dog rescue, and neither did my family. Since I grew up with fluffy dogs (wheaten terriers and Portuguese water dogs to be exact), I knew that when I got a pup of my own, I’d want one like that. What I didn’t know was that I would be able to adopt a shelter dog, instead of buying from a breeder, that would be everything I wanted and more. As I went about my search for the perfect dog, I knew exactly what I wanted. My dream dog looked just like my parents’ black Portuguese water dog, but I wanted something smaller that I could travel with. And I’d already decided that adopting was the way to go, so I had been searching online for months to find my perfect pup. Imagine how excited I was when I saw Wags and Walks’ Instagram post featuring this adorable little black fluff with a white chin (who looked exactly like my parents’ dog). I was in shock… how could a dog this perfect be in a shelter? She was exactly what I was looking for, and I couldn’t believe that she was available for adoption. What I didn’t know then was that every single day, there are thousands and thousands of absolutely perfect dogs sitting in shelters across the country, through no fault of their own. Growing up, I had this idea that shelter dogs ended up in a shelter because something was wrong with them… either they were aggressive, had health issues, or were just too difficult to live with. However, over the last 9 years that I’ve lived in Los Angeles, I’ve seen most of my friends adopt adorable, sweet, loving, well behaved dogs that I’ve completely fallen in love with. My friends’ rescue dogs have come in all shapes and sizes, which is what convinced me that my perfect pup was in a shelter out there somewhere, just waiting for to me to find her. Since I adopted Winnie almost a year ago, I’ve learned a lot about dog rescue. It breaks my heart that over a million dogs are euthanized in shelters each year, just because there isn’t space. I was also shocked to find out that 25% of shelter dogs are purebreds. So no matter what kind of dog you want, no matter how specific, Wags and Walks can find that dog in a shelter for you. I’ve also learned that dog rescue isn’t only about saving a dog’s life - for every dog that is saved, a family is completed. I can’t explain how much happiness Winnie brings me. She makes me smile and laugh every day, has taught me patience and responsibility, and has made my life infinitely better. When I think about how many shelter animals have found homes through Wags and Walks, I just think about how much happiness these dogs have brought to all of their forever families. To me, and to countless other dog lovers out there, the pure love that comes from a relationship with a dog is unmatched. So every time a new Wags and Walks dog finds a home, I get so excited when I think about how much happiness their new family is in for. I can’t even describe how lucky I feel to have found Winnie, my perfect pup match, and also to have found Wags and Walks. This is an organization of purely selfless people, who work day and night to save sweet dogs from high kill shelters. It’s been incredibly inspiring to see the ladies of Wags and Walks in action, and I’m so honored that they let me be a part of their team. I hope you’ll keep reading our blog, to find out about our adoptables, see pupdates of our alumni, get training tips and tricks… and of course, to see cute puppy photos and videos. 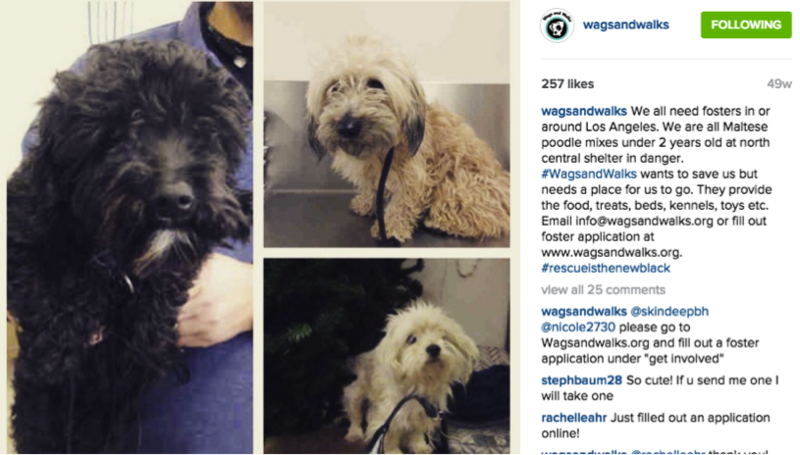 So, make sure you’re following us on Instagram, Facebook, Twitter and Snapchat (username: wagsandwalks). Also, don’t forget to sign up for our e-mail newsletter, and check our website for available dogs. You never know when we’ll find your perfect pup at the shelter.